School's Back in Session and so are We! It's finally fall lumberjacks! Come and see us this Sunday (8/28) for some amazing barbecue and worship! Starts at 6:30, looking forward to seeing all of you there! Monday the 29 of August is the official first day of school! Excited or not, come and get your backpack blessed in front of the Student Union on North campus between Starbucks and the Hot Spot! Starts at 7:30 and goes until 11:30! This coming Friday (9/2) we have an amazing opportunity to showcase our student's awesome artwork at Flagstaff's famous First Friday Artwalk! Check our Facebook group message for a place to send your photos by Thursday 9/1 so that we can have them printed and hung for Friday! Come and hang out with us starting at 6 pm and enjoy music and food and amazing friends! Sunday September 4 come and join us for regularly scheduled Dinner and Worship at 6:30! Free food, free jesus, free friends, free fun! WELL LET ME TELL YOU: Canterbury is this super cool and amazing group here in Flagstaff that is specially fit for young adults looking for a community of people who are just trying to figure it out! There is indeed free food if you were wondering (maybe we should have opened with that…), but most importantly, it’s a safe place to ask questions about faith or life, find new friends, and experience some amazing adventures! Canterbury is a place where you can be free to be yourself! We have events every week all school year: like our Sunday Worship and Dinner starting at 6:30, Wednesday night Dungeons and Dragons with some of our long time members, and First Friday Art Walks which are just a few examples! Come join us! All are invited, All Are Welcome, All Are Celebrated! Brad Eubanks came to the Canterbury Episcopal Campus Ministry in Flagstaff in October of 2013. He grew up in Missouri City, Texas, a strangely named suburb of Houston (ask him sometime if you want to know why it’s named that). As cradle Episcopalians do, he received his Bachelor of Arts degree from Texas Lutheran University in Theology/Youth Ministry, minoring in Psychology, with a Certificate in Leadership Studies. He then went on to receive a Master of Education degree in Student Affairs in Higher Education (Counseling and Guidance) from Texas State University. Read More about Brad here. Pilgrimage is one of the most important parts of many people’s spiritual lives. Many people go off to Spain, Ireland, or France to complete these pilgrimages. Some people go to the Holy Land. Some go to England. One of the most important components of many English pilgrimages is Canterbury, England. It has been for centuries. Many know about the ancient pilgrimage to Canterbury from the Canterbury Tales. Some know of the pilgrimages to Canterbury that happen today, such as the one that one of our freshmen this year just completed. Canterbury is a famous destination for pilgrimages, but many don’t know it is also an origin. One of the largest pilgrimages in the world is Spain’s Santiago de Compostela; and for many in England, Canterbury is the starting point for this spiritual journey. And then some go to college for their pilgrimage. And that is why Canterbury Flagstaff exists. We are many students’ origin, and many students’ destination. And for some students, we are just a stop on the way. Regardless of where on the journey a student is, we are here and ready to welcome them with open arms. Check out what Canterbury means to some of our students below! Learn more about our retreats! We need help making Canterbury a home for all. We need help funding this amazing ministry and building. Although we are now in possession of a new building, this building is not completely paid for. 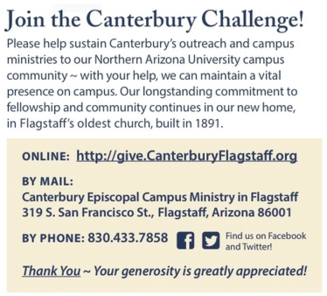 We need help paying back a generous loan given to us by the Episcopal Diocese of Arizona to ensure that this facility is able to be a place of pilgrimage for all students to come. Whether it is donating your time and energy to the ministry and upkeep of the building, or assisting in the funding of the building and ministry. It all comes down to you. This is your campus ministry, and it couldn’t happen without you. Thank you for all of your support in this: past, present, and future. You make this ministry what it is. Will you join us in the Canterbury Challenge? This is your campus ministry, and it couldn't happen without you! A ministry of the Episcopal Diocese of Arizona, we nourish the souls of students and young adults by cultivating a community of wisdom, prayer, sacrament, and mindful action to support minds and hearts full of wonder.